Looking for a new chicken dish? Do you enjoy goat cheese and rosemary? Then I have the recipe for you. I invited some friends over at the last minute the other evening. They said I shouldn’t worry about providing food, but I couldn’t let myself obey. I can’t have people over and not offer a little bit of something. The troubles is, I really didn’t think I had anything in the house to serve them. I had some grapes I could set out. I looked in the cupboard and found some mini italian breadstick type crackers. Did I have anything to go with that? I went to the refrigerator. I had some goat cheese! Yes! Goat cheese. I love goat cheese. So, I started scanning the internet for recipes. I happened upon a recipe at Epicurious for some herbed goat cheese that contained garlic and rosemary. I had some fresh rosemary in the garden and some garlic in the cupboard, so I had my solution for a cheese spread. My friends arrived, but apparently they took my statement, “I don’t have anything in the house to offer for food” seriously and came already filled with food. I was the only one who even tried the cheese spread, but it was addictive. However, at the end of the night, I had all this left over rosemary goat cheese because I do have a tad bit of self control. I could keep it for an appetizer-like snack. It was truly delicious that way. 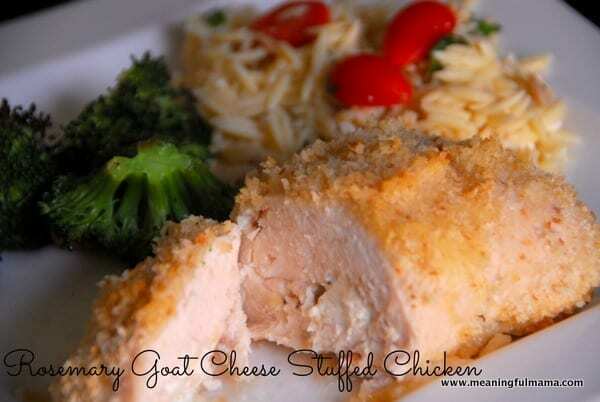 However, I also needed a plan for dinner the next evening, and I thought it might be fun to create a stuffed chicken with the goat cheese. We loved the results, so I thought I would pass the recipe along to you. I would encourage you to try the chicken, but if you don’t, the spread really is a wonderful appetizer with crackers or toasted baguettes as the recipe says. 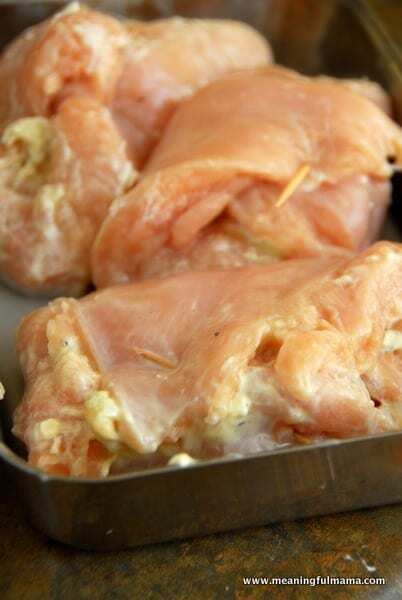 Pound 4 chicken breasts flat. 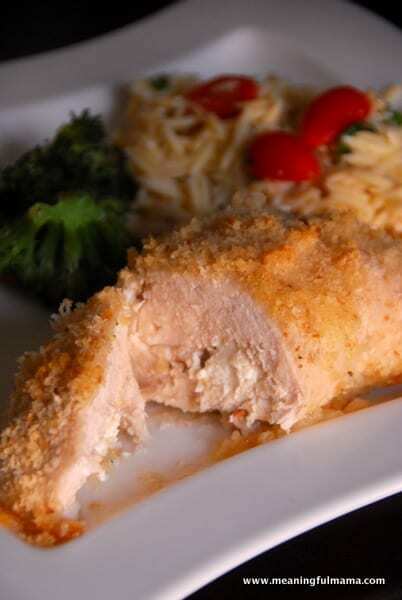 In a bowl, combine the two different kind of bread crumbs. Make up the herbed goat cheese recipe. It makes the perfect amount. 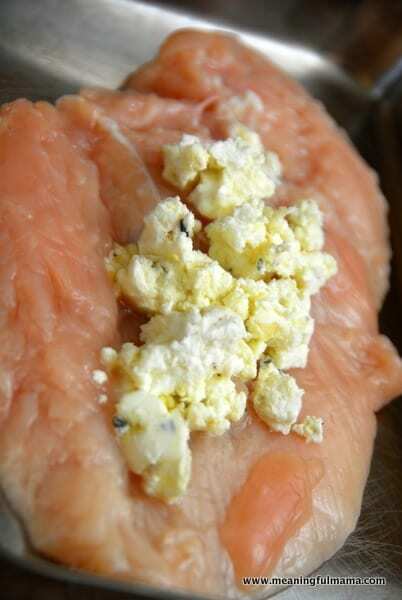 Put 1/4 cheese mixture per chicken breast. Roll up chicken and hold together with a toothpick. Don’t forget to remove the toothpick after baking. 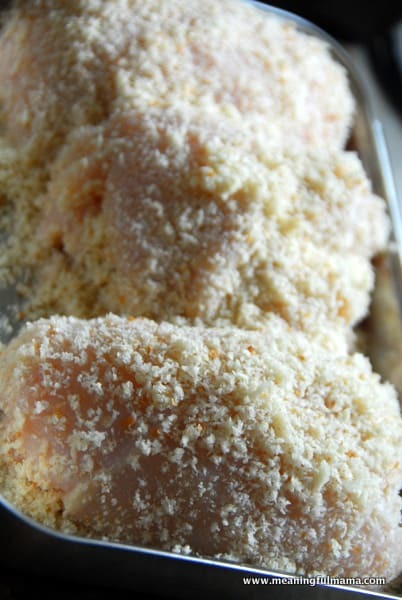 Roll each breast in the breading mixture. I like to sprinkle a bit extra on top before I put them in the oven. Put butter in a baking dish and set in the oven until melted. 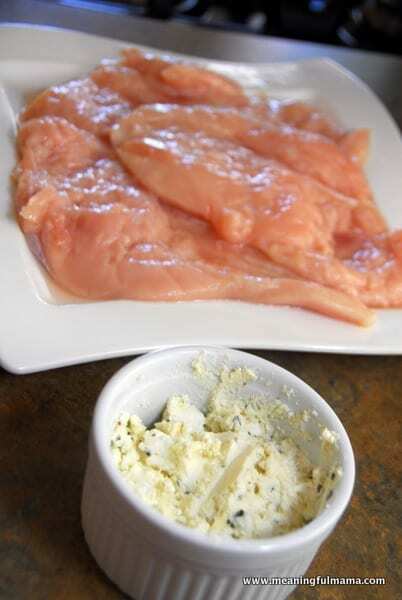 Add chicken breasts to the butter in the baking dish. Bake at 350 for 30-40 minutes or until the internal temperature reaches 170. Let me know if you try it. We loved it around here. What did you serve with the chicken? Just out of curiosity. I did broccoli, and I had an greek orzo salad…recipe to come. I think it would taste good with some herbed rice rather than the orzo also. Enjoy!